As we go deeper into the season of spring, the world is shedding its neutral cloak of browns and grays and blossoming into color – from palest pink to sunny yellow to bright, spring green. I love the green haze of the woods at this time of year. Lovely! 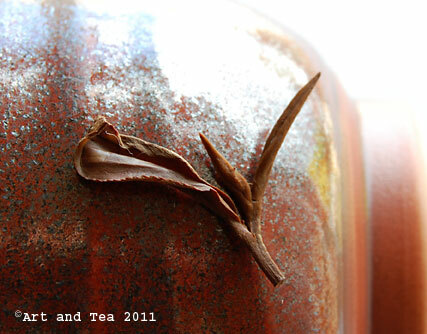 This morning’s tea, called Keemun Jade Pekoe, is a black tea from China with an unusual leaf shape for a Keemun. 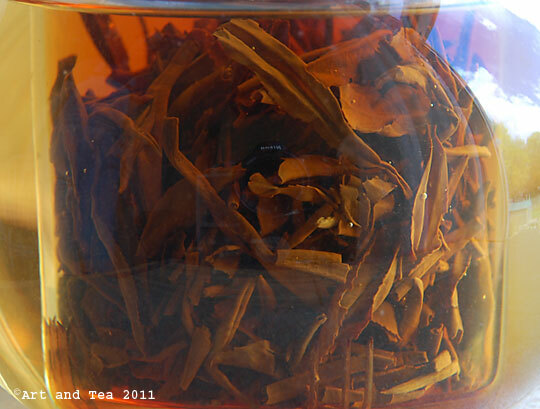 The long, flat leaf blades remind me more of a Lung Ching, a China green tea I’ve shared with you here. I steeped the leaf for 4 1/2 minutes in boiling point (212 F) water. The leaf is handcrafted from a fine plucking (2 leaves and a bud) as you can clearly see from the photo below. 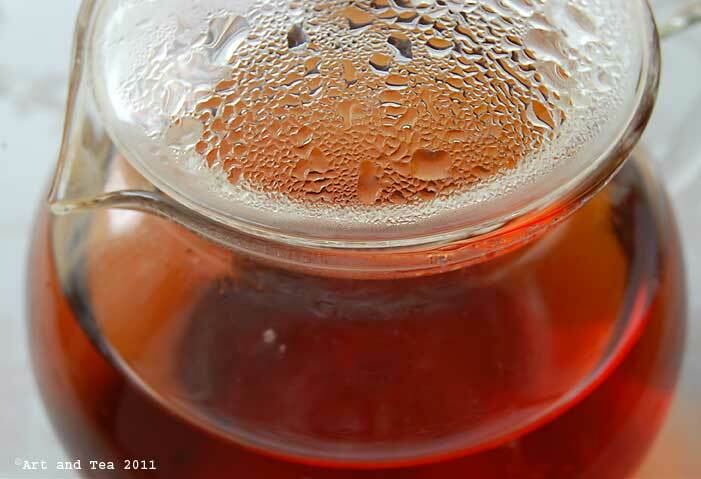 The steeping tea gave off a sweet, cocoa aroma, warming my kitchen and my soul. Being a confirmed dark chocolate lover, I enjoy a China black best when it has notes of cocoa. The dark amber liquor has the typical Burgundy notes of Keemun, rich and sweet. There are also hints of nutmeg in the very smooth cup. Do you like my new little teacup? I treated myself during my visit out to Michigan. I purchased it at Teavana. While I’m not really into their exotic fruit-flavored tea concoctions, I do enjoy browsing their selection of tetsubin (iron) and Yixing (unglazed clay) teapots. I also love their Buddha and Guan Yin statues. They always have such a look of serenity on their face. Today is a day for getting back into my garden to nourish and ground my soul once again in its earthy beauty. Have a wonderful week, my dear friends! 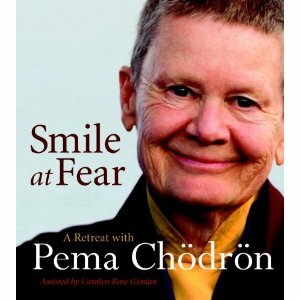 This entry was posted in Black Tea, Life Musings, Photography, Tea and tagged China Keemun tea. That tea does look yummy. You cup runneth over.. it’s beautiful. What a fantastic looking tea! Looks like at least one more sample in my next order. Love the tea cup! It is my favorite on their site. It looks unglazed at least on the outside…is it? I also like the “Metalliic” tea cups. Thanks for the great review. 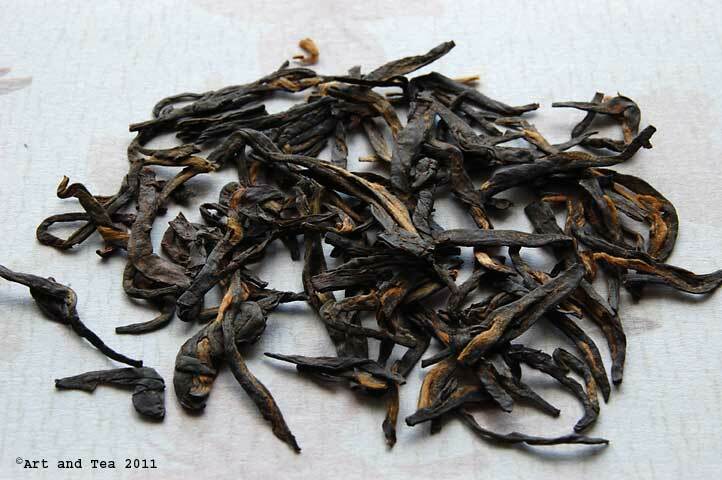 On this early Sunday, I plan on drinking some Fuding White Treasure….probably this afternoon. Cheers :). 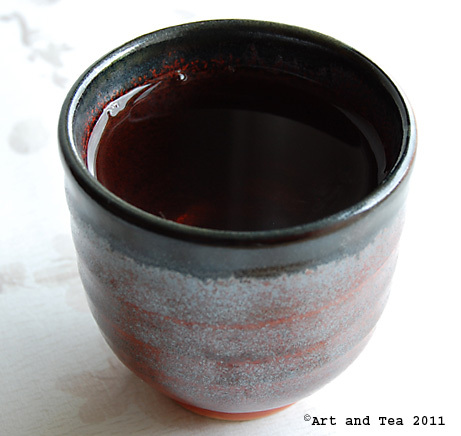 I tend to like unglazed asian teaware. Most tokoname teaware is unglazed as is my Sushi cup. I reread your post & see that yours is unglazed, but it does look as if it may have had a glaze on the inside from the pic. I’m gonna go have another cup of Shadowlands….it’s almost gone :(. Thanks Scott! My new teacup is glazed, except for the outside bottom. Hope you enjoyed the Fuding!